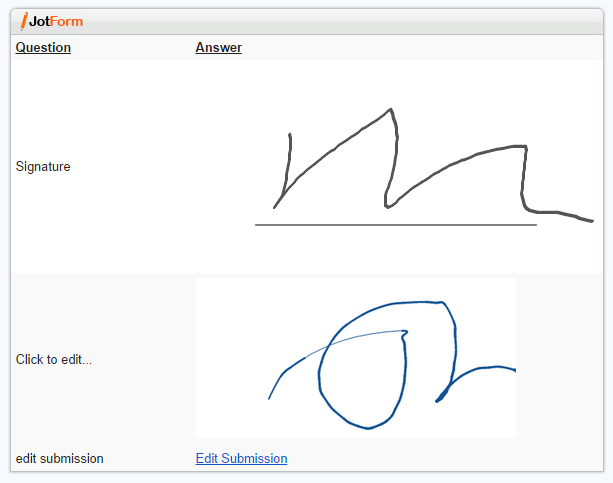 Why can't I edit a form to sign the smooth signature widget? I have dealt with this problem in the past and thought I had it resolved by using different web browsers to sign the form after it had been submitted by my client. At times it has worked in my regular web browser, Mozillla Firefox. The last two forms I have needed to sign would not allow me to edit the smooth signature widget although I tried on two different computers and three different browsers on each one, including a newly installed chrome browser. These are the same contracts that I have edited to sign the smooth signature box in the past. This is getting really tedious not knowing each time if it will let me sign or not. Can anyone help? Somehow the Smooth Signature Widget is not available when in Edit Link mode. then, using the cloned version, remove the Smooth signature widget and add it back again on the form. Then, do a test submission and edit the submission. Check if in Edit mode, the editing of the signature is working already. I will also submit already a bug ticket report regarding the issue that had been discovered with the Smooth Signature Widget. Our next level support will provide update response on this thread once they have news on the status of the ticket submitted. I just tried cloning the form as you suggested and removing and adding the smooth signature widget, but when I tested it it still would not allow me to sign. I'm sorry to hear that it's still giving you problems even in the cloned version. Since it didn't work that might be because sometimes our results can vary such as my colleagues but thank you for trying it anyway. I would like to acknowledge that a bug report has been issued for this problem of yours and our developers will look into getting it fixed as soon as possible for you and we will update you about it here as soon as we can. I took a look at the link you have provided http://submit.jotform.us/form.php?formID=40988784423165&sid=286872034801742888&mode=edit and yes, you are right it is not working for me neither. I will let the developers know about it. This is probably because you need to re-add the widget to your form to accept the latest updates. Removing the current smooth signature widget may cause you to loose all associated data - so please try this out on a clone(copy) of your form as shown here. 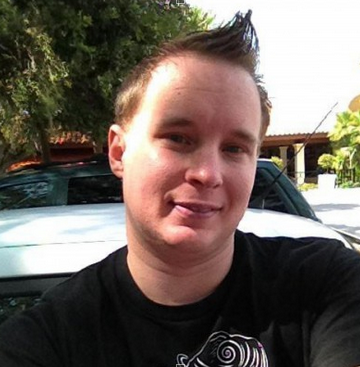 hey @amber, can I ask if the signature image was sent to your email notification or its just a blank image? It seems that the signature was successfully loaded on to your form when edit mode. The only problem is that its just an image without a signature. I can confirm that the widget still working fine, I just want to ask though if they submitted the form without filling it up. I recommend to make it as a required field. Or if you just want to edit it right away then just click the clear button instead. The form you sent me seemed to be working fine. 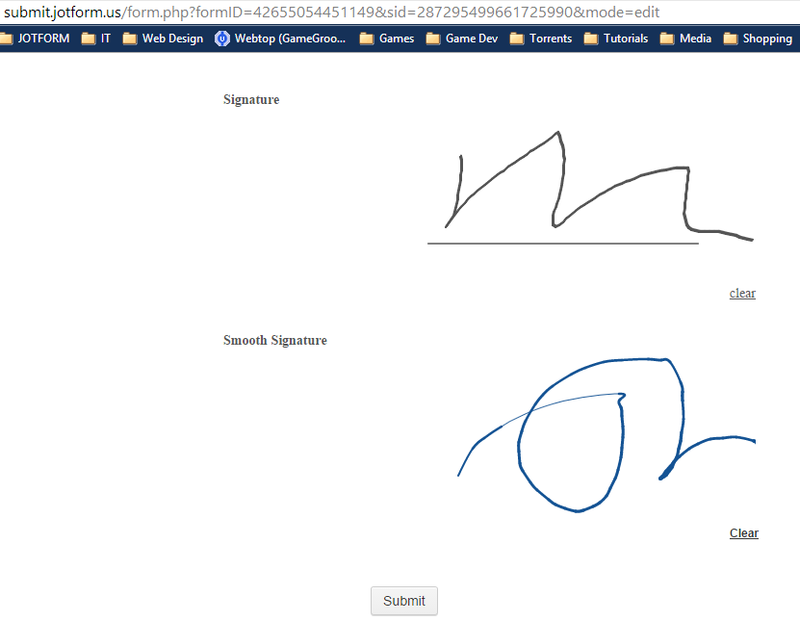 The e-signature form was signed, and the smooth signature widget was left blank and I was able to edit it. Does that answer your question? I do not want to make the smooth signature field required, as it is not for my client to fill out, but for me to sign after they have completed their part and sent it to me. I will try cloning the form and re-adding the smooth signature widget again to see if I can get this to work on my own. I just tried the clone and it worked great. Thanks everyone! I tested this on my side just now via a brand new test jotform and I happen to agree with you. It appears that there's still a problem with editing the smooth signature widget. Are you clicking on the "Edit" in your submission viewer or are you clicking on an edit link form you email notification? I've discovered that the problem seems to recur only when the edit button in an email notification is used to edit the submission. I'll notify our developer to see what he has to say about it just in case. Hey @amber. I'm glad that your previous form now works great. But with your second form, you are now using a page break(pagination) which really having a problem in most of our widgets. That's why it appears that the widget was hidden somewhere and can't display itself on its own. A great work around is that when you realized a widget signature was not there. Press the BACK button and then press the NEXT button again. This is our temporary solution for the widget to appear under page breaks. Sorry for the inconvenience btw, widget team are doing their best to solve these kind of problems. KadeJM, thanks for your response. I tried to edit both from the email notification and the submission viewer, neither are working for me on this form. widgets, thank you for responding. The problem I am having is not that I cannot see the widget or signature, but that I cannot edit the smooth signature form. I just found a possible solution to this problem. When trying the wedding contract form again, I was able to edit the smooth signature form after hitting clear. My other form does not require me to hit clear to edit. Neither one of them had been signed previously, so not sure why the difference, but as long as it continues to work this way it will be fine. Thanks for all the help, everyone. I'll admit that the fact of this happening on both for you is indeed a bit strange but our widget developers are aware of it as mentioned above. I see that it appears to be temporary or at least on my end this is the case as after trying it again when edited now works normally. Additionally, you're welcome. I think the alternative solution happens because you've reset the signature so this clears out the existing glitch allowing it to work normally afterwards. 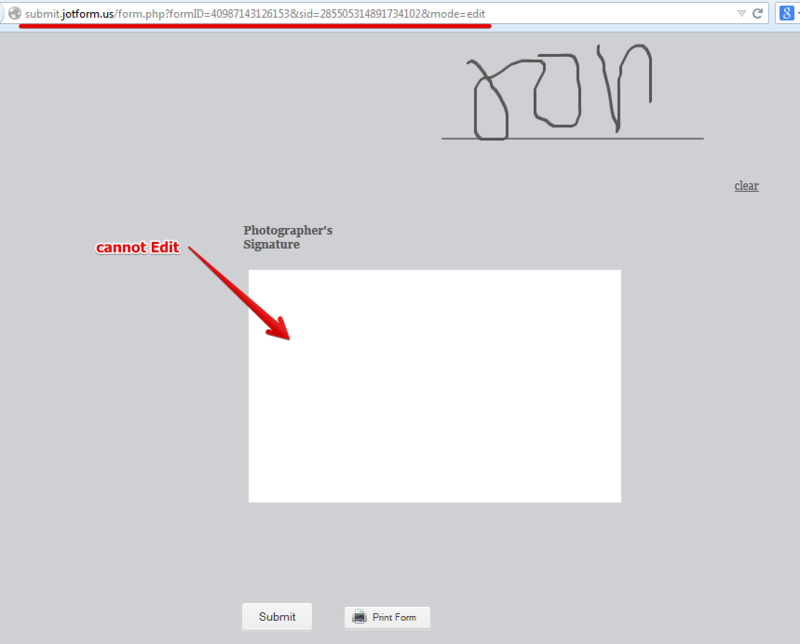 Yes you have to click the 'clear' button for you to edit the signature. 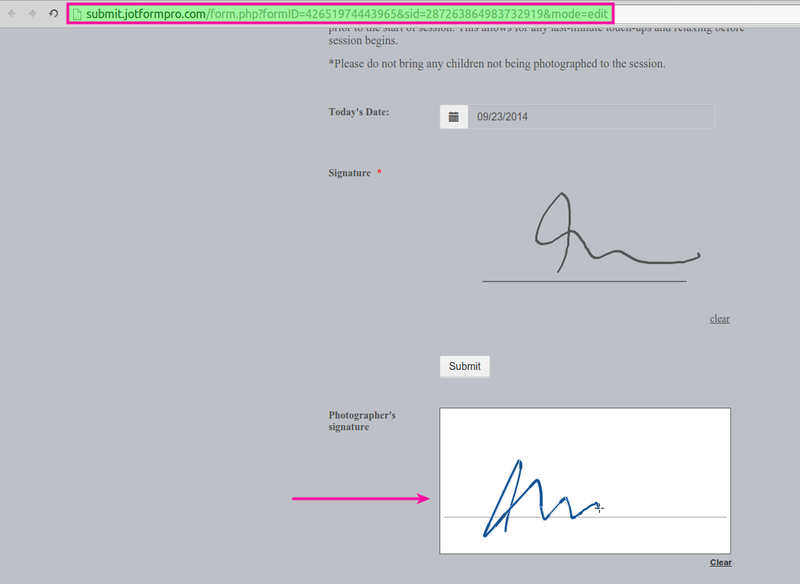 Because by default, when its viewed it was actually an image of the signature. Just remember that sometimes that signature widget will not appear on a form with page break(pagination) like one of your forms. If it happens to be then please do what I said from my previous post to make it appear and then click the Clear button to edit it. If you have any problems please let us know so that we can further assist you.